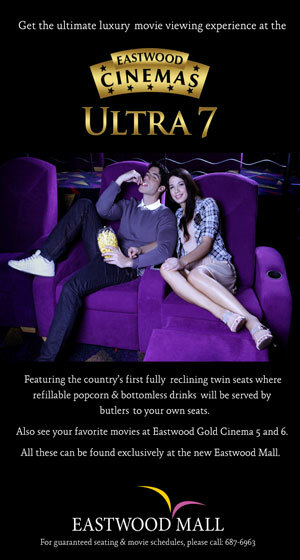 I finally got the chance to experience the Eastwood Mall's Ultra 7 Cinema, which, according to this ad (see left) is the 'ultimate luxury movie viewing experience'. I went with a grrrrlfriend who wasn't an Ultra 7 virgin so she was able to explain to me where everything was, 'everything' being the restrooms and the lever to release the footrest. What she didn't reveal was that those suckers do not slowly rise up from the chair – they explode upwards. When we got to our seats, my friend immediately went into a comfy position with her free popcorn by her side and the seat fully reclined (the seats really do transform into a bed – do not attempt to watch at Ultra 7 if you are even just slightly sleepy unless you want a really expensive purply nap). Meanwhile, I was trying to fight the cold air using only a flimsy shawl for protection. After I acclimatized, I attempted to release the footrest but forgot that I was wearing my flowery flipflops. After I pulled the lever, my left slipper went flying through the air and down the next level. It was pure providence that no one was hit and that it didn't happen while the movie was showing. There was, however, the problem of retrieving it. Important bit of info to divulge at this point: My whole family is prone to muscle cramps. Every now and then, we get competitive about who has had the weirdest cramp location (like the 'wala ka sa lolo ko'-type contests*). Regular people get cramps in their legs and feet. I have gotten cramps in my fingers (like while toothbrushing, and then I feel like I will never let go of the toothbrush), little toes (when this happens, it's cute – it looks like two of my toes decided to become best friends and literally lean on each other), chest muscles, tongue (nothing dirty here, it happens when I inspect one side of my oral cavity in the mirror for too long), upper back (like when putting on a sports bra), tummy (I'm sure there are abs underneath the fat), and so on. I think my worst cramping experience was when I had to try on a kind of full-body shapewear that was REALLY tight. I put it on through my head and shoulders (instead of stepping into it like smart people do) and needed the help of my sister to force it downwards. It wouldn't go down smoothly. Instead it gathered into a narrow band across my shoulders and chest. Midway through the struggle, I felt almost all of my main muscles cramping, which was aggravated by laughing loudly at my reflection and my sister who also had the living energy sucked out of her from laughing at my sorry, cramping state. We really had to take a moment (with one of us half-naked, with a black monster of a thing wrapped around most of the top half of her body) and calm down before we finally succeeded. So anyway, my slipper was far from me and I couldn't get out of my chair because I couldn't force the footrest downward. Because it was so cold in the theater, my leg muscles were already stiff to begin with, so when I had to use them to push, they just (naturally) cramped up. Once again, there was someone laughing asthmatically beside me while I was suffering in agony and trying to figure out a way out of my seat. All I could do was hug my sore legs and stifle my otherwise loud laugh. I tried again after the cramp subsided a bit but it took more than two attempts before I was able to rescue my footwear. All in all, it was a good adventure. Luxurious, even. Most importantly, I finally satisfied my curiosity about Ultra 7 and my left slipper finally tasted the sweet joys of air travel. *Pinoy private joke; I do not accept the challenge of translating or explaining this. I sometimes get a cramp in my neck if I yawn too hard. All the more reason to avoid boring lectures.